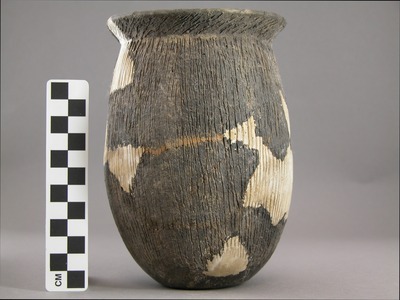 "41BW3, 6-3-198" by Timothy K. Perttula and Robert Z. Selden Jr.
DECORATION (INCLUDING MOTIF AND ELEMENTS WHEN APPARENT): The vessel rim is decorated with closely-spaced diagonal incised lines pitched from right to left. The vessel body has closely-spaced vertical incised lines that extend from the rim-body juncture to just above the vessel base. Karnack Brushed-Incised jar (6-3-198) in Zone F of the platform mound at the Hatchel site.